The Samsung Galaxy S6 flagship is expected to arrive in March during the MWC 2015 event. Over the past few days, we’ve seen a handful of leaks of the device telling us what to expect. 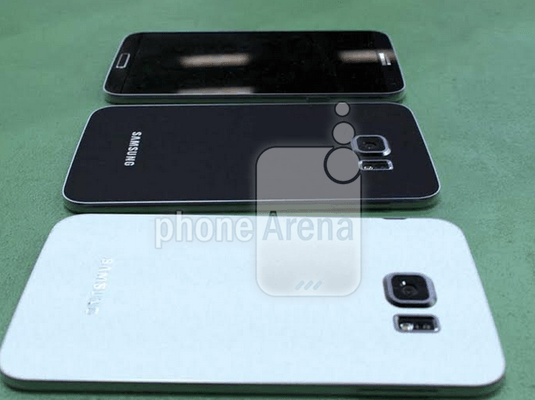 Today, an alleged prototype of the Galaxy S6 has been spotted in a fresh leak, courtesy of Phone Arena. There’s not much word about the device itself, but we can see that the design has been changed substantially. The positioning of the rear flash/heart rate sensor has been changed which is now located right next to the sensor rather than beneath it. We also sense a very flat design with rounded edges in the corner. There’s a lot more protuberance near the camera sensor compared to the predecessor, but that’s understandable since the company is expected to use a massive camera sensor with the Galaxy S6. This fresh leak reinforces reports of Samsung using a non-removable back cover with the new flagship. It’s pretty clear that this device uses a metal frame which has been rumored for a while now. The front portion of the device doesn’t reveal a lot, but we can clearly see that the physical home button is in place. Since this is merely believed to be a prototype unit, we’ll wait for more confirmation before rushing to judgments. What do you think of this new leak?